It has bikes, people shopping, posters, 7-11 and men with “European man-bags”. While touring Stockholm I suddenly realised. 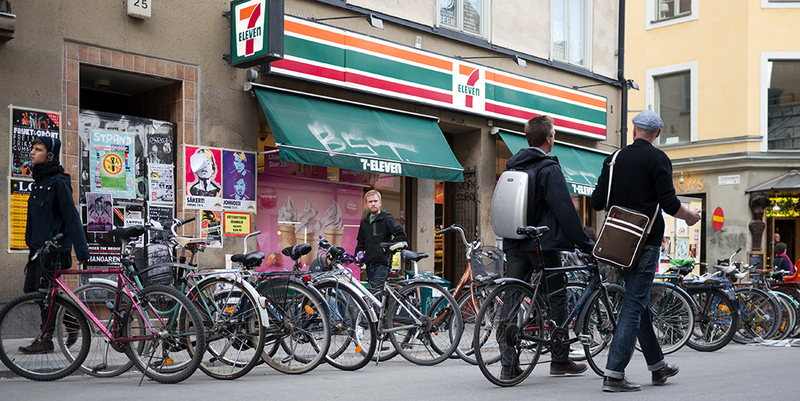 “Holy crap there are a lot of 7-Elevens in this city !”. And Google would seem to bear that out. Map of Stockholm with 7-Eleven. And the nice man at one store didn’t bat an eye when I went in a raided his shelf of Japp bars to bring back for Jaap in the office. Apparently there is a whole series of banned Japp bar commercials .. The posters are interesting too. If you notice around the edge of the posters in the background there is brown tape. In the mornings you would see hip young men pulling posters out of their bags, attaching them to walls and moving on. Just like fly-posters have for generations ! Except in Stockholm a little old man from the council would come by in the evening and pull them down. The tape made that job a lot easier. Seems like an interesting detente has been established. Would be only be made more awesome by the council charging the posters to re-use them then next day and so in effect recycle them until the event. All images and content are copyright © .